I just happened to see a post in a Facebook group about an event with Bud Selig in Milwaukee. He had an hour and a half scheduled to speak about the integration of baseball and its aftermath. Upon further investigation, I discovered it didn’t cost much and the money would be supporting a good cause. Plus, how many opportunities does one get to see a former commissioner speak in person? It was a no brainer to try to attend such a unique event with such interesting and important subject matter. I contacted a good friend and we made plans to attend. The weather has been a bit dicey lately, so we crossed our fingers for good driving conditions and things turned out. 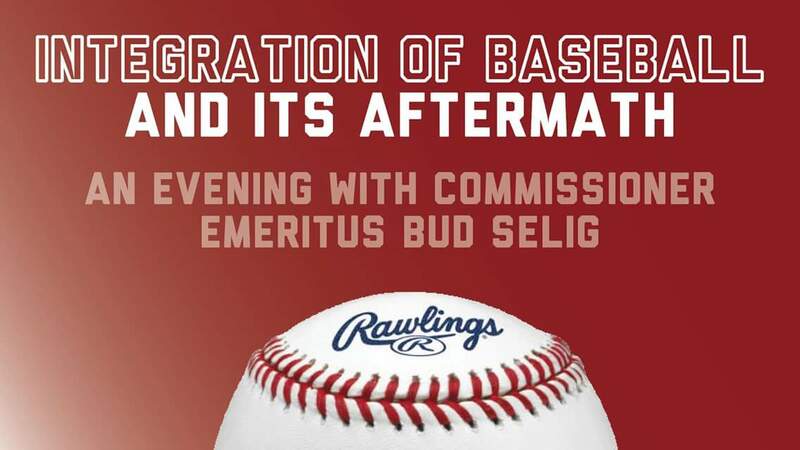 On Wednesday, February 7, we were off to Milwaukee for ‘An Evening with Commissioner Emeritus Bud Selig’. 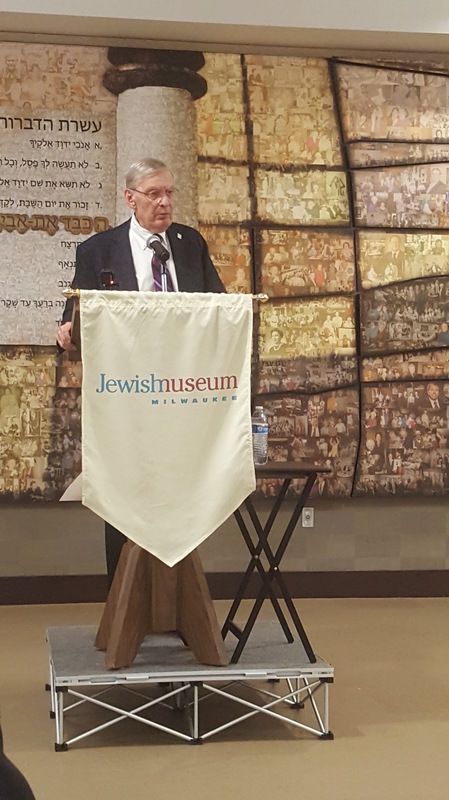 Selig’s presentation was part of the museum’s current exhibit, ‘Allied in the Fight: Jews, Blacks, and the Struggle for Civil Rights’. The exhibit runs through March 25 and highlights Black-Jewish collaboration with the Civil Rights movement. Besides the artifacts on display, the exhibit includes a few other presentations and a bus tour of Milwaukee’s Civil Rights historical sites. Selig started by taking everyone back to the 1940’s through the story of Jackie Robinson breaking the color barrier. He talked about the efforts of Branch Rickey and Robinson paving the way for others such as Hank Aaron, Willie Mays, and Bob Gibson. Selig called Robinson’s debut as the most important moment in baseball history, due to the ripple effect it had down the line. He said that sure, you could point to things that Babe Ruth did, or Aaron, or others – but none had the cultural impact on our society as Robinson playing in the majors. Selig firmly stated several times his belief that baseball is a societal institution. He pointed to examples from Robinson’s story, including that Martin Luther King had speeches in the 60’s citing examples from Robinson’s struggle breaking the color barrier. Selig peppered his Robinson story with his own personal views – including seeing Robinson play at Wrigley Field for the first time. He has known Robinson’s widow Rachel for many years, and said that without her that Jackie would have had it much harder. Of course, black integration wasn’t the only integration in baseball, and Selig also spoke about Jewish players like Hank Greenberg in the 1930’s having a rough time. He also mentioned Latino integration and that currently their numbers in MLB are much higher than African Americans. Clearly, there is still work to be done. But as Selig stated a few times over the course of the evening, the sport isn’t perfect but has come a long way. One of the positives in Selig’s baseball societal institution theory is the RBI Program (Reviving Baseball in Inner Cities), and he talked about the tough places such as Compton, CA, where the program makes a difference. Many other charitable initiatives were launched during Selig’s tenure as Commissioner besides RBI. He also was involved with getting the Step Up to Cancer (SU2C) program off the ground in 2008, among others. The evening wasn’t all seriousness, as Selig dropped in anecdotes. He made a few quips about his longtime friendship with Aaron, but also told stories about seeing the pile of horrific mail the home run king received when chasing Babe Ruth’s career home run record. Selig also gave credit where it was due. A case in point related to the retiring of Jackie Robinson’s No. 42. Ken Griffey Jr. called and asked Selig why every team couldn’t wear No. 42 on Jackie Robinson Day (April 15) and not just the Los Angeles Dodgers. Mariano Rivera became the last active player to wear the number after it was retired, but had talked to Selig and said he’d change numbers if it was disrespectful. After a conversation between Selig and Rachel Robinson, Rivera was given the go-ahead, but not before Selig asked him to call Rachel and talk to her about it. About an hour into the presentation, Selig opened it up to the audience for questions, remarking that we could ask pretty much anything. A couple people chose to ask his opinion on football topics, such as Colin Kaepernick and the anthem/kneeling controversy. Selig said he’d rather stick to baseball topics (fair enough) and that football has its own set of issues. Someone brought up Paul Molitor leaving the Brewers over contract issues and that it didn’t seem like he was in the same regard as Robin Yount. Selig pointed to his number being retired and that he wore his Brewers cap into Cooperstown as examples of his historical significance with the team. Another question centered around team owners lobbying for stadium financing. Boy, if you ever want to hear a passionate argument from Bud Selig, ask him this question. He brought up studies of economic impact and things that you can’t measure – such as the visual of visiting fans from other cities streaming past his office in the downtown. Selig balanced his serious stance on stadium financing with a funny story about dragging along Aaron, Yount, and Bob Uecker to speak with a senator in Madison about financing Miller Park. The evening blew by quickly, and even though I had a notebook along I didn’t bother writing anything down. I also had my camera in a bag, but never pulled it out, and only captured a couple shots on my phone at the tail end of the presentation. A bunch of people mobbed Selig on his way out and managed to get a few photos and a couple signatures. I overheard him say he was a bit beat as he taught his class at Marquette earlier in the morning. Speaking of college, after seeing him in person, I’m certainly jealous of his students! I’ve read that he often receives high marks from students for his instruction on baseball and society since WWII. 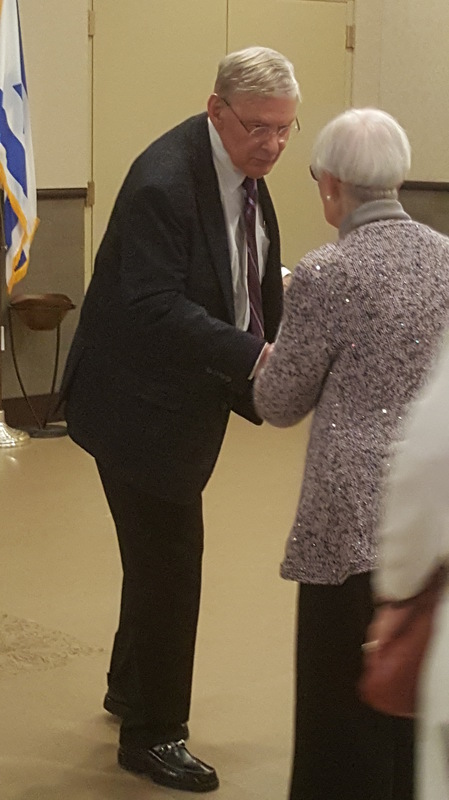 We sincerely thank the Jewish Museum for being gracious hosts, and Bud Selig for an engaging and informative presentation. The Jewish Museum Milwaukee explores the history of the Jewish community in southeastern Wisconsin. The museum uses a variety of exhibits and interactive components to celebrate the community and the American and Jewish experience. The museum is located at 1360 North Prospect Avenue, and you can learn more on their web site.